Whether you are looking for a unique gift or simply want to enjoy a fun shared experience with a couple of friends, our group beer making workshops are just the ticket. As the longest established provider of beer making workshops in London, we've guided thousands of happy customers through the art of making their own special brew. 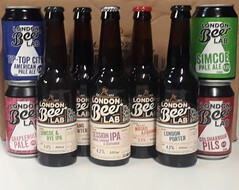 London Beer Lab was founded to share the knowledge and joy of brewing and that's exactly what you'll receive on your brew day. Join us at our Brixton taproom, with is plenty of beery inspiration on offer, where our expert instructors will aid you in crafting your recipe and guide you through the brew process right up to pitching your yeast. At the end of your 4 to 5 hour brew day, your brew will be placed in a temperature controlled room at our brewery to ferment. Three to four weeks later, you return to bottle* your beer and one week later sit back and enjoy the fruits of your labour. * For a moderate strength beer, the target volume of beer brewed is twenty litres which roughly equates to 60 330 ml bottles. This final volume can vary for several reasons and is not a guaranteed final volume of beer brewed by you. A: A voucher must be redeemed within one year of purchase, however the workshop need not have taken place by expiration date. Q: I would like to purchase a workshop as a gift, do I get anything to give to the recipient? A: Yes, if you purchase an open dated group workshop voucher you will receive an email confirm with a link to your PDF voucher. We will email you a voucher code that the recipient can use on our website to book a specific workshop date. If you book a specific date group workshop voucher, then you will receive an email confirmation with a link to your PDF ticket. Q: I have a voucher, how do I redeem it? A: Use your voucher code at checkout after selecting the date you wish to book (see here). A: To start with, you need to make a decision on the style of beer your group would like to brew. A recipe is crafted for you based on criteria you provide. Then you measure out grains and mash in. During the mash our instructor will give an overview of the whole brewing process from start to finish, while sampling different grains and hops. After the mash, you will need to sparge the grain prior to bringing the wort to the boil. Once boiling, hop additions will be made prior to cooling and transfer to a sanitized fermenter. A gravity check will be made and you'll add your yeast before we move the beer to a temperature controlled room to ferment. Once fermentation has taken place, we will send an email to you in regards to returning to bottle your beer. A: We strongly recommend to bottle the beer within about 6 weeks. When left in the fermenter for several months most types of beers will develop off flavours and can become fairly undrinkable. We reserve the right to dispose of the beer if you have not made arrangements to bottle and collect it after 2 months as per terms and conditions. A: Unfortunately we do not have parking facilities, pay and display parking is available locally.